Dr Romylyn Metila and Ms Lea Angela Pradilla of ACTRC’s MTB-MLE research team presented two papers at the 11th International Symposium on Bilingualism (ISB11) at the University of Limerick in Ireland on 11-15 June, 2017. The biannual symposium attracted more than 300 participants from around the world. 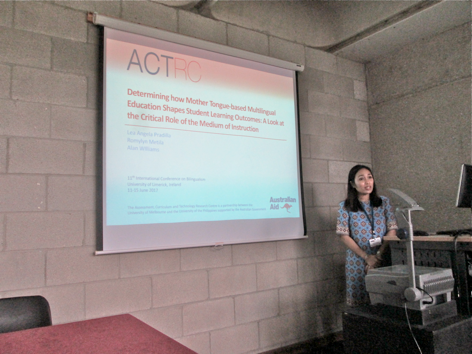 The team’s first presentation, Determining How Mother Tongue-Based Multilingual Education (MTB-MLE) Shapes Student Learning Outcomes: A Look at the Critical Role of the Medium of Instruction, discussed the results of Phase 4 of the ACTRC project, Understanding Best Practices in MTB-MLE in the Philippines. The study found that students learning in their mother tongue had better literacy outcomes than those taught in another language, and that students whose mother tongue was a lingua franca performed better than those whose mother tongue was a local language. The second presentation, Linguistic Diversity in Mother Tongue Education: Program Adaptations and Emerging New Speaker Identities of Multilingual Teachers and Students, discussed the development of new speaker identities through the use of a lingua franca or common tongue to promote social cohesion in a linguistically diverse school in the Philippines. The use of the lingua franca for formal instruction was combined by teachers with the use of multiple languages for clarification in classes where pupils had diverse mother tongues. This approach encouraged social cohesion while complementing the program’s principle of multilingualism by accommodating languages other than the lingua franca. Members of the audience asked about aspects of MTB-MLE implementation in the Philippines, such as the mechanics in choosing a language for medium of instruction, plans of the Department of Education for the program, and program dynamics in linguistically diverse schools. There were also inquiries about the data gathering activities of the study and the nature of the assessment tool used. ACTRC’s MTB-MLE research has recently ended its fourth and final phase. ISB11 is one of many platforms through which results of the study are disseminated.